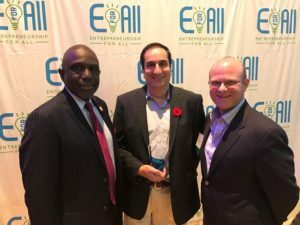 MassDiGI was honored with the first-ever Innovation Award at the 2016 Entrepreneurship for All (EforAll) Summit in Lowell, Mass. on November 3. EforAll is an organization that works with mid-size cities to spur economic growth and create social impact within the community. This international conference brings together city leaders, investors, foundations, organizations, and schools committed to entrepreneurship and social impact in mid-sized cities. Summit speakers included entrepreneurs Ted Leonsis, owner of the NBA’s Washington Wizards, the NHL’s Washington Capitals and former senior executive at AOL, and Doug Rauch, former president of Trader Joe’s. MassDiGI Executive Director Tim Loew accepted the Innovation Award. “Our work with entrepreneurs and students over the years has been rewarding and humbling in its own right – and being recognized for that is very meaningful,” said Loew. Loew participated in a panel at the Summit entitled “How to Keep/Attract Young People in Mid-Sized Cities.” Panel discussion focused on methods that cities, organizations, and colleges can deploy to retain an energized group of young people looking to make a difference. Fellow panelists included Andy Vargas from EforAll, Justin Kang from City Awake, the civic innovation lab of the Greater Boston Chamber of Commerce, Karina Leblanc from the University of New Brunswick’s Pond-Deshpande Centre for Innovation and Entrepreneurship, and Chris Miller of the St. Louis-based Mission Center L3C which is an incubator and accelerator for high-impact social enterprises. Reposted from becker.edu with additions, minor edits. MassDiGI welcomes partnerships with corporations, foundations, schools, colleges and universities. View more supporters of MassDiGI or become one yourself.